Aimé Argand (Swiss physician and scientist). Sir Joseph Banks (scientist; President of the Royal Society, 1778-1820). Dr Thomas Beddoes (physician and founder of the Pneumatic Institute at Clifton in Bristol). Dr Joseph Black (Scottish chemist and physician). Matthew Boulton (entrepreneur and engineer). Charles Clagget (maker of musical instruments in Dublin). William and Henry Creighton (engine erectors and agents). Maria Edgeworth and Richard Lovell Edgeworth (daughter and father, both authors). Robert Fulton (American scientist and pioneer of steam navigation). Joseph Fry (physician and entrepreneur). Samuel Galton junior (a Quaker merchant and gunsmith in Birmingham, who began a series of chemical experiments in the 1770s). Thomas Henry (chemist and surgeon-apothecary in Manchester). Dr William Irvine and James Keir (chemists). 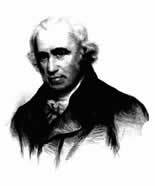 James Lind (physician, cousin of James Keir and close friend of James Watt during his Glasgow days). Jean Hyacinthe de Magellan (scientific investigator working on reflecting instruments). Margaret Miller (first wife of James Watt, she died in 1773). William Murdock (engineer and inventor of gas lighting). Joseph Priestley (scientist and thelogian). John Rennie (civil engineer, millwright and agent for Boulton & Watt). Dr John Roebuck (inventor and founder of manufactory of Sulphuric Acid at Prestonpans in 1749, creator of the Carron Company; he sold his interests in the Watt engine to Matthew Boulton in 1773). Natural Philosophy at the College of William and Mary in America, before travelling to England and becoming Matthew Boulton's family physician and a key member of the Lunar Society). Jonathan Stokes (protegé of William Withering, interested in pneumatic chemistry, botany and the classification of fossils and plants). Thomas Telford (engineer and surveyor). James Watt Junior and Gregory Watt (the sons of James Watt; of particular note are James Watt Junior's letters describing his travels in Europe, especially news from Paris in the early 1790s. Gregory Watt describes his stay with the Davys and his tour in Germany, Switzerland and France). Josiah Wedgwood (master potter at the Etruria factory in Staffordshire; Chairman of the General Chamber of Manufacturers and regular member of the Lunar Society). William Withering (physician, botanist and mineralogist). A complete file of Watt's own outgoing letters, largely in press-copies (from 1779 onwards) but supplemented by original letters to his family and retained holograph drafts, are also an important part of this archive. "If Dr James Hutton wishes to make a geological map of Cornwall he writes to Watt; if Dr Priestley wishes to have a careful observer of his experiments on gases it is to Watt that he turns; if Berthollet wants to know of the practical developments in chlorine bleaching he consults the man to whom he first explained the properties of gas, James Watt..."
Eric Robinson and A G Musson authors of James Watt and the Steam Revolution (London 1969) and the collection of essays in Science and Technology in the Industrial Revolution which draw heavily on the Doldowlod material, now made more widely accessible to researchers throughout the world through this project which provides comprehensive microfilm coverage of all these papers.